My first real-life exposure to music was through the art of chanting. Studying Byzantine music, I learned first-hand the practical conditions for the correct performance of melodic lines that frequently feature delicate intervallic relationships. Later on, when I started studying European music, my experience of Byzantine music was particularly helpful. From both areas of music, I tried early on to collect and systematize all information as well as I could for my own and my studentsβ benefit. I have collected this experience and knowledge in the book you have in your hands. 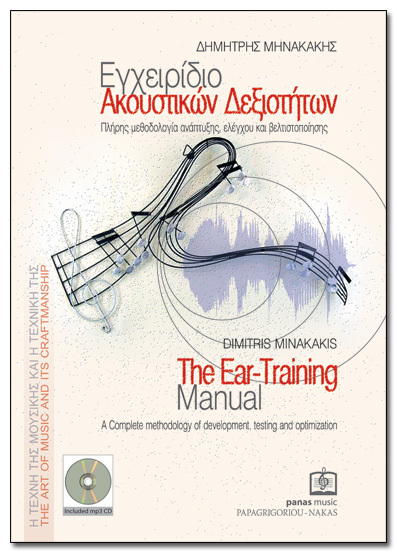 The βEar-Training Manualβ constitutes a complete method that covers the entire spectrum of music education, from the simplest intervallic relationships to contemporary techniques. The syllabus is divided in two parts: the first deals with issues that refer to tonal and modal music; the second one introduces elements of free atonality and the twelve-tone system. In all constituent chapters there are exercises of progressive difficulty. Every exercise type suggests methods of instruction and learning for teachers and students, respectively. For the more complex exercises, students may initially practice their rhythmic recitation until they feel completely familiar with the rhythmic difficulties of each exercise. Identification and execution of melodic intervals. Exercises in the twelve-tone and atonal idioms, approaching progressively all intervallic relations. Melodic exercises with piano accompaniment using material from all constituent units. βInner Hearingβ refers to the ability to perceive the sonic outcome of a music score without the aid of a performance. From the first steps, students must try to βimagineβ the sonic outcome of each exercise. This ability can be attained gradually and through a variety of ways: for example, in two part exercises students may play one voice and try to imagine the other one with the βinner earβ. Each unit consists of melodic exercises that can be performed with the appropriate harmonic accompaniment, which is indicated in several cases. However, teachers or students must not play the melody when performing the accompaniment. The development of music ability is inexorably linked with the ability to conceptualize the music relationships and structures that relate to a particular music score. For this reason, students must be familiar with the theoretical background and notation of each exercise. The symbols used in this book correspond to the ones most widely used in music theory literature, both in terms of Roman numeral analysis and Functional Harmony. Students must pay particular attention to practicing keyboard harmony. They can extend the melodic exercises at the piano, improvising on the given harmonic progressions or expanding them, using a characteristic motif.Β In the second part of the book, becoming familiar with the piano part is particularly helpful in understanding the music content of each exercise, as well as in performing the exercises with the appropriate pitch accuracy. I deeply thank Professor Theodore Antoniou, composer, conductor, pedagogue, and president of the Greek Composers Union for the prologue of this book. In this book I presented material that, in its greater part, I taught and shared with many of my students. I would like to express to them my gratitude, because it was with them that I systematized the knowledge presented in this book through all these years. I would also like to thank my students, music instructors Evangelia Iliopoulou and Anna Volpanou, for their contributions in editing the Greek text and their overall observations. I would particularly like to thank my son Stratis and his wife Dolores for the English translation and their overall observations; my daughter Georgia for her encouragement; and my wife Giota for her invaluable support in my lifeβs efforts. I hope this book may become a valuable tool to all those that would like to learn and teach the art of music and its craft. The numbering of reference's pages is two more in the exercise book than the theory book, by misprint. When we see page 22, in exercise book we will go to page 20 of theory book. Download the right file from hierΒ . . .